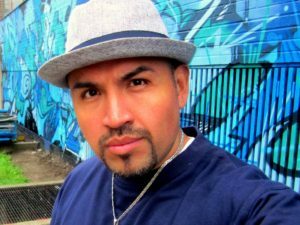 started his art journey as an urban artist, project coordinator, educator, and one of Toronto’s well-known street artist. Angel has created art for Samsung, StreetARToronto, Pemberton Group, Holt Renfrew, Athlete’s World, Bell, Telus, Campbell’s, Rogers, MTV, City of Toronto, the O.P.P., OCAD, and University of Toronto. He has been featured in Pound Magazine, The Globe and Mail, Toronto Sun, TorontoStar, Inside Toronto, Champ Magazine and on CityTV, CTV, and Global. He has taught urban arts workshops for events like Nuit Blanche, Manifesto and Style in Progress. Angel is also very active in community and outreach programs like Laser Eagles and events which he has helped run for the City of Toronto, Mural Route, Schools without Borders and YMCA. He is a frequent speaker at discussion panels for the city’s graffiti laws and the need for public art space and funding.